WAYNE DOSICK is a rabbi, writer, speaker, spiritual guide and healer, who teaches and counsels about faith and spirit, ethical values, life transformations, and evolving human consciousness. He is the founder and spiritual guide of The Elijah Minyan in San Diego, California— a group of Jews seeking to shape and enter Judaism’s coming new era through God-centered worship and learning, spiritual renewal, and personal growth. The services Rabbi Dosick conducts and the classes he teaches are highly acclaimed for their deep prayer and meditation, joyous singing and chanting, and warm, heimesh atmosphere that encourages deep connection to God, and to a community of friends. He is the host of SpiritTalk Live! : Journeys into Mind, Heart, and Soul, a weekly Internet radio program, heard on HealthyLife.net, and SpiritTalk Live! TV a weekly Internet television program seen on WazilloMedia.com. SpirtTalk Live! is a worldwide conversation for exploring the great questions of existence, for joining in the quest to find meaning and worth in life, though intellectual inquiry and sacred spirit. Rabbi Dosick is the author of the new book, The Real Name of God: Embracing the Full Essence of the Divine, published by Inner Traditions- Bear & Co. The Real Name of God is the intriguing and fascinating account of the revolutionary discovery of the Name of the Whole, Complete God, and coming to know the grand God of the vast universe, and the Inner God of breath and soul; a journey on pathways of mind and spirit that brings each one of us into deep, personal, intimate, loving relationship with God, and closer to a world of Oneness. He is the award-wining author of eight previous critically acclaimed books. For almost twenty years (until its untimely demise) he was a Contributing Editor of The San Diego Jewish Times, which published more than 400 of his bi-weekly columns, “Rabbinic Insights,” his religious, political, and social commentary. He was an early pioneer in Jewish video, creating The Video Synagogue (1982) which brings religious services by means of videotape to those confined to home or health care facility. For more than seventeen years, Dr. Dosick served as an Adjunct Professor and Visiting Associate Professor at the University of San Diego, teaching the only courses in Jewish Studies at this Catholic university, where he was also active in interfaith consultation and programming. Rabbi Dosick’s trans-denominationalism in the Jewish world is evidenced by his memberships in the Rabbinical Assembly (Conservative), the Central Conference of American Rabbis (Reform), and Ohalah (the Association of Jewish Renewal Rabbis.) He is a past president of the San Diego Rabbinical Association, and for six years, he served on the national Board of Directors of Mazon: A Jewish Response to Hunger, where he chaired The Rabbinic Table, and now serves on its prestigious Advisory Council. Articles about Rabbi Dosick and his books have appeared in more than 90 newspapers and periodicals, and he has been interviewed on more than 150 radio and television shows, including “Good Morning America,” the Larry King Show, CNN, and NPR. He has spoken and conducted seminars, workshops, and has been scholar-in-residence at more than 200 bookstores, synagogues, churches, schools, universities, hospitals and health care facilities, businesses and corporations, and community organizations throughout the country. He is a master teacher who has taught in settings as diverse as: The Aleph Kallah, Elat Chayyim, Ruach HaAretz, the (West Coast) National Chavurah Institute, and the Wexner Foundation. He and his wife, Ellen Kaufman Dosick, MSW, are the co-authors of Empowering Your Indigo Child; A Handbook for Parents of Children of Spirit, the world’s first and only spiritual healing for Indigo Children - and Adult Indigos, too. As Dean of Development, he was instrumental in bringing a branch of the pluralistic rabbinical and cantorial seminary, the Academy for Jewish Religion, to California, and still serves on its Academic Advisory Council. 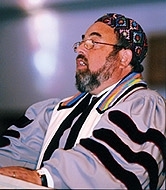 In 1998, his alma mater, the Hebrew Union College, awarded him an honorary Doctor of Divinity degree in recognition of his twenty-five years of innovative and sacred service to the American Jewish community. In 2005, the Jewish Theological Seminary also awarded him an honorary Doctor of Divinity degree, making him one of the few rabbis to be recognized by both America’s Reform and Conservative seminaries with an honorary degree. Rabbi Dosick is married to Ellen Kaufman Dosick, MSW, the world master practitioner and teacher of the psycho-spiritual therapy Soul Memory Discovery, and the channel-author of the bi-monthly publication, Cosmic Times. They live in La Costa (north suburban San Diego) California, with Mugsy the Dog and Tom the Cat, where their home is a center for learning, prayer, and healing, and a gathering place for intellectual and spiritual seekers. Rabbi Wayne Dosick, a dynamic, inspiring teacher and guide, brings the message that contemporary society can be transformed when we bring the God-centered transcendent and immanent world of the spirit, along with enduring values, to our businesses, our communal institutions, our faith communities, our families, our children, and our own hearts and souls.